Every three years, a new Campus Sustainability Plan(CSP) is created as a resource for the nine sustainability working groups on campus. The Plan establishes goals, objectives, and metrics that will help the working groups track their progress in the years to come. 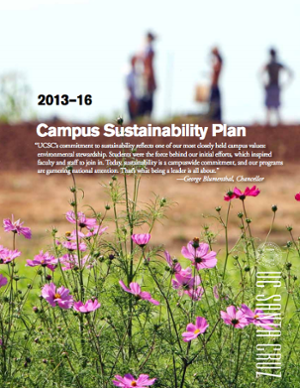 The new 2013-16 plan is now available online and is meant to build on the work accomplished in the 2010-13 Campus Sustainability Plan. It sets a high, but achievable bar in the nine topic areas related to sustainability, including a new topic area: "Awareness, Education and Engagement".